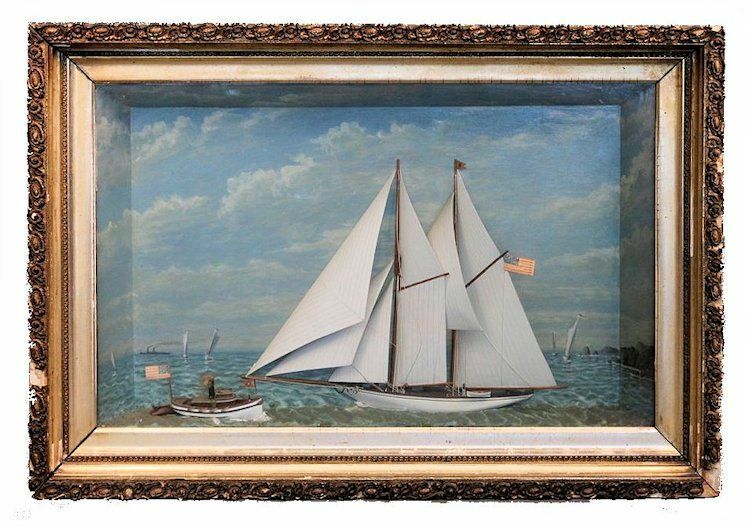 Presented is an extremely rare shadow box model of an unnamed American schooner yacht of the last decade of the 19th Century, with a small screw steamer yacht close off her port bow. 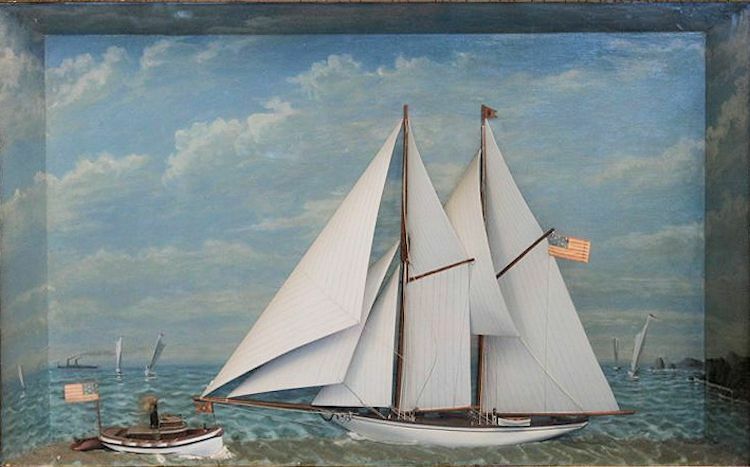 There is a 13 star American "Boat" flag flying from the schooner's main gaff and a swallow tail house flag showing a padlock from the main truck. There also is a yacht club pennant laying on the deck forward of the dinghy. The small steamer flys a swallow tail pennant from her bow staff and the American flag with ten stars showing from the stern. The workmanship of both models are of very high quality and the background painting was done by a skilled artist. It shows a landmass to the viewer's right and gaff headed sailing vessels fore and aft. There is a good sized steamer in the left background. PROVENANCE: From the Rum Room of Anthony's Pier 4 Restaurant which was closed in 2011 and demolished due to the Boston Harbor waterfront renewal project. CONSTRUCTION: The models are handcrafted of block wood and are in-cased in a sturdy shadowbox or diorama. The hull and deck houses are made of block and the full sails are carved from wood that has been hollowed out to give them their realistic shape with panels carefully scribed in pencil. The painted sky has fair weather clouds over a paper mache' sea with a gentle chop. There are other vessels on the horizon and a landmass to the right. The overall appearance is of a Fine painting. The wood case has its original wavy glass. CONDITION: The gold gilt wood frame has an ornate plaster design that is missing a piece in the lower right corner and a missing element four inches from the bottom left. There are other small pieces missing, but these are not as apparent. The corners of the frame could use some tightening, but the case is strongly built and sturdy. 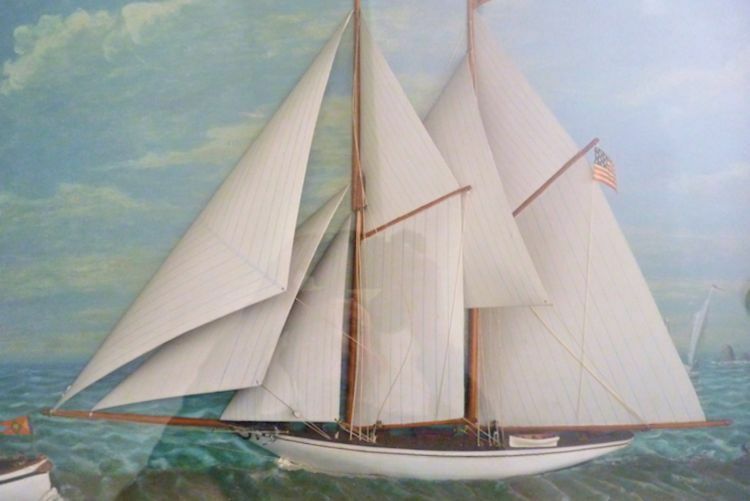 The schooner model is in excellent condition except for a few pieces of its rigging which have fallen. This includes an unidentified yacht club pennant that is lying on the deck. There are a few miniature crew on deck and one has fallen off the yacht and rests in the right front corner. The sails are carefully made out of tin bent to shape as an airfoil. The panels are hand painted in blue outilne. There is a full compliment of light weather canvas consisting of a flying jib, jib, and fore stays'l at the bow. Both masts are gaff headed with a topsail and a large fisherman stay sail between the masts. SHIPPING, INSURANCE & PACKING: This model should be shipped by an antique courier service. Please inquire for options.